MOUNT HAGEN, Papua New Guinea — While in transit at Port Moresby, the coastal capital of Papua New Guinea, I pick up a copy of the national rag, The Post Courier, and there on page 6 is an ad for the IEA Photographic Essay Exhibition this coming weekend. It seems the International Education Agency has empowered teachers, students, even pre-schoolers, with computers and digital cameras, asking them to shoot photo essays, the best of which will be on display. So the digital life has come to New Guinea, though Port Moresby is the only reach on the island that might be called a city, with its 350,000 residents. Some 85% of the island's six million still live in remote villages, most as subsistence farmers and rain-forest foragers. The interior remains largely a land apart, and there are valleys still that could be called lost worlds. Just two generations ago, none of the people living in the Highlands had ever seen metal, the sea or white men, and their first sight of a wheel was on an aircraft, landing on a crude strip hacked out of the jungle by Australian gold prospectors. Even today life hasn’t changed all the much for the Highlanders, though change is literally in the air. There are no roads that connect Port Moresby to the great mass of the interior: the only way in is to fly. So we board an Air Niugini Fokker and head into the clouds. At Mount Hagen, the main township in Western Highlands province, we meet up with Bob Bates, the Australian-born owner of Trans Niugini Tours, a resilient company that has been operating for almost 30 years. Bob came to the then-Territory of Papua New Guinea in 1964 and for six years worked as an engineer building early tracks and bridges. 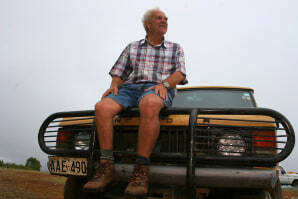 I had met Bob in 1976 when I first came to New Guinea to scout for rivers to run. He flew me about in his Beech Baron, and drove me along the washboard roads in his battered Range Rover, both of which he still operates today. It is Bob who is helping us find the Digital Village. Perhaps more than any other individual he has explored the backcountry of New Guinea, and has visited many extremely remote settlements and outposts. There is one village to the far west of here he thinks will suit our purposes, and with his help we hope to reach it. Today, though, Bob introduces us to his operations manager, Mombom “Lawrence” Walep, 32, who hails from a village down the Waghi River Valley to the east of Mount Hagen. Lawrence has a foot in two very different worlds — his home village of Wamul, near Nondugl, where he maintains strong ties, and the quasi-modern world of the 40,000-strong Mount Hagen. It’s a sort of Deadwood frontier town with a huge outdoor market where outlying villagers come to barter pigs, birds of paradise feathers, kina shells, brightly woven bilum bags — woven twine sacks we might call “ditty bags” – tropical fruits and vegetables and other jungle goods. These can be exchanged for staples such as cooking oil, salt, tobacco, pig ropes, betel nut from the coast, and used t-shirts and shorts imported by missionaries and coastal entrepreneurs. Lawrence considers himself lucky. He was educated in a government school, and spent two years in a Catholic seminary, and through hard study mastered English. He was ready, though, to settle for village life when he heard about a sales clerk job for Trans Niugini Tours. He applied, along with 300 other applicants, and got the job. Today, though, he is returning to his village to visit his family and “wontak” (literally “one talk” or linguistic group), something he tries to do every month or so. He invites us to come along, saying we will be only the third group of “tourists” to visit his village. We throw our digital gear in the back of a Land Cruiser and start a two-hour trundle down a road outstanding in the quantity and quality of its ruts. Lawrence carries with him an SLR camera given to him by one of the company’s pilots, and a single roll of 24 exposure film, which costs about a day’s wage. He is planning to take some photos of his family, process them, and send them back along with the part of his salary he regularly returns to his clan. He is the only one in the family to have ever left the village hearth, the first to ever land a job with a wage, and he feels both proud and a bit guilty. As we park the car and begin a long, steep hike up a mountainside, we pass an elderly woman tending her pigs. She sees us and begins to wail like a ghost. She’s shaking and sobbing, and at first we think she is distraught, or frightened. But Lawrence explains she is actually joyful, that this is how they express overwhelming happiness. Another woman approaches making ambulance sounds, and as she reaches out to shake my hand tears run down her dark cheeks. At the village entrance Lawrence asks us to wait and chew some bananas as he speaks with the village chief, his uncle Mr. Bund, about our visit. We wait, and an hour later are invited to step through a garlanded gateway, down a path lined with tulips and marigolds, into the village of Wamul. Two men in grass skirts are playing yard-long bamboo flutes, a haunting tune that unfolds like a prayer. Four others dressed in brilliant plumage and hides are dancing some sort of jig as they stab spears in the air. We’re witnessing, Lawrence tells us, a sing-sing. Sing-sings are elaborate ceremonies performed on special occasions, such as to mark a marriage, mourn a death, honor a tribal hero, pay homage to ancestors, beseech spirit gods for good crops, or for the arrival of special guests. The village is honored, we’re told, that we chose to call, and they want to show off their best spectacle. We step into the village commons as about 40 men, women and children begin their elaborate show, a stomping, pounding kaleidoscope of color and sound. They parade about thumping hourglass-shaped hand drums and whooping like cassowaries; jangling necklaces, anklets and bracelets of pig tusks, shells and bone; bobbing headdresses made from long bird of paradise plumes trimmed with red parrot feathers. Off to the side one man whets a stone adze, another tends to his pet sulfur crested cockatoo, and a couple of elderly women blow on bamboo mouth harps. As the pageant unfolds Lawrence pulls out his camera to take some photos of his sisters and cousins prancing beneath the sheltering pandanus trees. But the camera doesn’t work. He pushes buttons and shakes the box, but the film will not advance. He is losing the moment he hoped to capture. Didrik Johnck, our expedition photographer, notices Lawrence’s frustration, and lets Lawrence borrow one of the HP Photosmart digital cameras we are saving for the Digital Village. In a trice Lawrence is back shooting his family in motion, capturing village scenes, and crafting his own art. At the end of all the dancing, Chief Bunda gathers his village around and speaks through Lawrence as the interpreter: “We are the last part of the world. We are so isolated that we are feeling a little scared and embarrassed with your visit. White visitors are new to us, and we hope you will accept us.” Then he calls for a mu-mu, a hot-stone barbecue of sweet potatoes and chicken, and we sit down to feast. Evening approaches as we head down the hill, back to Mount Hagen. At the hotel Didrik pulls out the Photosmart 375 printer we are carrying, a printer tinier than a coconut. He inserts the memory card and asks Lawrence to choose an image. He picks one of his cousin Hanna — her face swirled in brilliant colors, her nose daubed an arterial red, her hair gushing in tail feathers, her breasts covered with a mantle of possum fur. As the image prints out Lawrence exclaims, “Wow. I don’t believe this. You’re doing this with such a small machine. If my family sees this they will talk about this for the rest of their lives.” Lawrence prints out several more of his family and his village, saying he will deliver these with delight on his next trip home. Lawrence himself is a harbinger of change in the Highlands, something about which he has mixed feelings. The village elders, he says, are concerned about losing their culture, and they call some who have left for the lights of town “long-long,” which means crazy. Lawrence says he appreciates the tightly woven tapestry of traditions, grounded with ancient links to the land, that have remained largely intact in his village, despite the growing seductions of religion, technology, and a nearby cash-based economy. 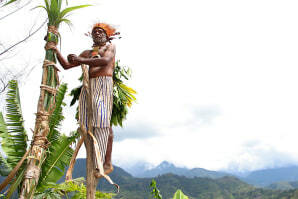 Great Escapes is exploring Papua New Guinea in search of the Digital Village, filing daily dispatches along the way. If you have a question or comment, mail us at greatescapes@msnbc.com.